As an agent, you can chat with up to six customers. You need to be part of a queue to receive chats coming to that queue. When a customer chat arrives in the queue, it is offered to the available agent who has been waiting for the longest time. Agents can chat with up to six customers. Agents can accept or reject incoming chats. Chat is offered to the available agent who has been waiting in the queue for the longest time. Agents can access the customer nickname, last name, first name, and email ID in the pop-out chat window's title bar. Remote customer assistance is offered via chat using the Co-browsing capability. Click Profile in the main menu. In My Profile page, go to QueueA queue is an ordered collection of interactions waiting to be served by agents qualified to respond to these interactions. 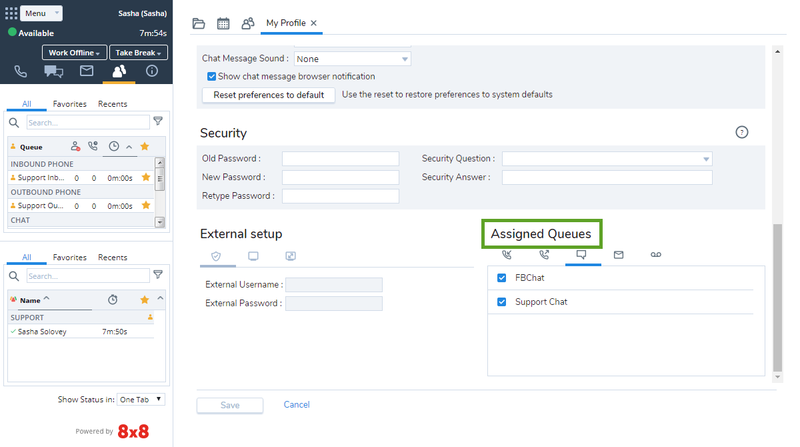 In addition to enabling the call center administrator to customize how incoming interactions are prioritized and routed, queues also ensure that interactions are never lost or discarded. Assignment and open the Chat tab. Check if you are assigned to the right chat queue. Click to accept the chat. The tab changes to , indicating the number of active chats waiting. 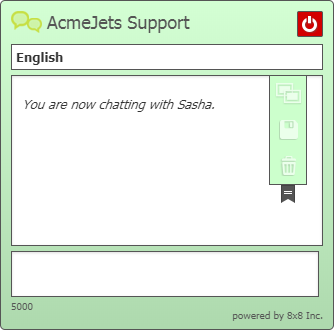 If it is an existing customer, the chat list gets updated with the customer information. The customer's detailed record also opens in a new tab. Note: Click to open a chat window. The title bar in the pop-out chat window shows the customer nickname, last name, first name, and email ID. If it is a new customer, it shows the Transaction ID. The blue status icons indicates if a customer has sent you a message and waiting for your response. If the customer waiting time exceeds SLA, the status icon turns red in the chat list. For details, refer to Multi-Chat Table. Open the chat window as desired. When you are done chatting, terminate the chat session by clicking End. To save the chat transcript, click in the chat window, and select Save from the menu. Note: The customer name remains in the chat list while the post processing window is open. Closing the pop-out chat window closes the window, but does not end the chat. 8x8 offers remote customer assistance via chat using the Co-browsing capability. Co-browsing is available by subscription only and must be enabled by your administrator in Configuration Manager. Once the administrator enables Co-browsing for chat, agents can invite customers for Co-browsing during a chat session in Agent Console. With Co-browsing, agents can quickly help customers find the information they are looking for, or clarify any questions they may have. Open the chat interaction menu, and select Invite for Co-browsing. 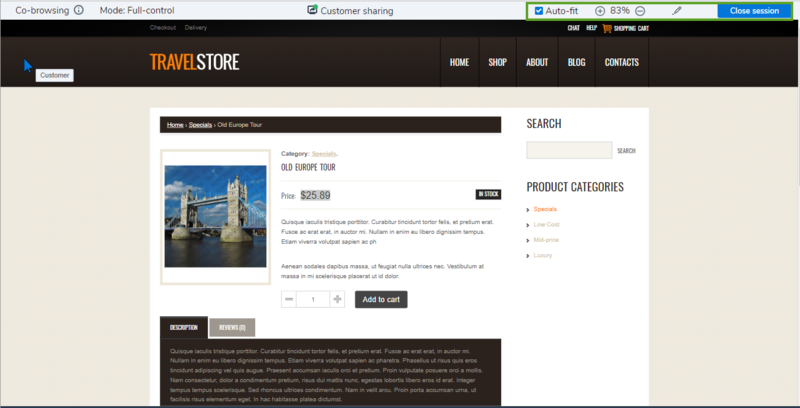 The customer is prompted to accept the invitation for Co-browsing, and clicks Yes, Start Sharing. You can see the customer's screen now.